Our daughter Kay has already explained how we got to where we are now: across the garage from her and her family in our 826-square foot palace, which was designed by her husband. With his vast computer knowledge, he was able to take our desires and put them into an actual drawing, then turned over to the company that built our home. The best part is being just across the garage from Kay and the family. That means we don’t have to go outside in bad weather to be a part of their lives. Since we combined households in September, 2012, we have had dinner with them on Sunday nights. They make the dinner and I make the dessert. I really love to cook. Being the dessert-maker keeps me on my toes since I try not to repeat anything too often. Last Sunday we were treated to “gourmet hot dogs” with a variety of toppings, including chili, onions, cheese and sauerkraut – our son-in-law’s invention that their two sons love. After dinner we were talking to Kay in the kitchen. 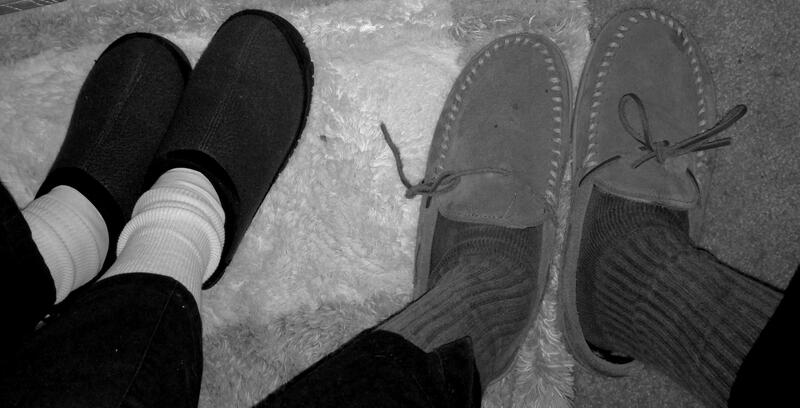 I happened to look down and both my husband, H, and I still had on our slippers! Since we are across the garage and not subject to snow and ice and boots, we had just picked up the cake and started across, completely forgetting about the slippers we were wearing. What a joy, I realized! What a joy it is as well to share these times with our grandsons, B and R (ages 6 and 11). They often come to visit us in their slippers, too. My name is Kay. I am an overly-busy American adult. I am no different from every other woman: kids, marriage, careers, houses, mortgages, health concerns. A few years ago, a series of events began in my life that at last I could not ignore, and the Great Recession put my parents’ retirement in jeopardy. Throughout our trials, my husband and I realized that my family had been an unwavering support network. We lived two hours away from my parents, yet they made the trip to visit us quite often. Likewise, we visited them often, and we soon realized we were spending more and more time on our visits helping them keep up with the maintenance on their 5-acre property and house. We encouraged my parents to consider selling their house and move someplace that required fewer resources to keep up, and we were thrilled when they finally told us they were ready! So we began the process of helping them clean up and clean out the house – and then had to face the reality that time and the Recession had taken their toll on the market for their property. Suddenly, it became clear that selling the house was not a feasible option. At the same time, we were looking for a change in our life. We weren’t sure what we needed, but my husband, C, and I were feeling restless. So one day, I came home from work and asked C if we should consider moving closer to my parents, and when he immediately agreed, our decision was all but made. I found a new job and we got our kids ready to leave their friends and school. Then, we did something that surprised even us: we decided to offer to buy the house from my parents and build an addition for them to live in! My parents were as shocked as we were at this offer, but they jumped at the chance, and in September of 2012, they moved into their attached cottage. We became the Sandwich Family. We have learned a lot through this experience. This blog is our story, told from the perspective of me, the Sandwich Daughter, and MaryRob, the Sandwich Mother.